The Sun has been so pivotal to our ancient civilization that we still continue many of the practices that our ancestors engaged in, giving prominence to the life-giving Sun and Nature. Many of those practices and beliefs were intertwined with astrology, the ‘science’ of reading our lives with the help of celestial objects. Hence, the transition of the Sun from Pisces (Meena) to Aries (Mesha) has become a major celebration in Sri Lanka over the centuries. The Sinhala and Hindu New Year that dawns tomorrow is an opportunity to reaffirm our bonds with each other and with Nature itself. Avurudu, (the more popular vernacular term) is also celebrated in many other Asian countries under different names. It is a joyous national event that brings all Sri Lankans, here and abroad, together. Avurudu is sometimes likened to a person, through the reference to an Avurudu Kumaraya (New Year Prince). He is supposed to be a radiant individual who brings prosperity to the whole village and the whole country. In fact, in keeping with this theme, many Avurudu festivals select an Avurudu Kumaraya and as well as Kumariya (Princess). Although primarily celebrated by Sinhala Buddhists and Tamil Hindus, Avurudu celebrations see the active participation of all communities and religious groups. Avurudu is the perfect time to shed all differences – ethnic, religious and political – and support endeavours to establish lasting peace in our island. Unity and peace will be key themes for the Sinhala and Hindu New Year this year. Peace should begin in our hearts and in our homes. This is the lesson that Avurudu teaches us. It is a time for forgetting all past disputes and for giving and forgiving. It is a time for re-engaging in cultural traditions that we have nearly forgotten. Avurudu makes us admire and cherish our age-old moral values that are centred on the village-temple-school axis. Avurudu is perhaps the only event that motivates the entire populace, from Point Pedro to Dondra Head, to sit down for a meal at the same time and begin work at the same time. Many Sri Lankans living abroad also follow these auspicious times. Avurudu teaches us the value of togetherness, respect, forgiveness, punctuality, peace and co-existence. These are timeless traditions that we have inherited from our forefathers, ones we should in turn respect and perpetuate for posterity. Avurudu is a time for renewing bonds within families and among relatives. It is not unusual or families and relatives to be at loggerheads over various matters, but there is no point in continuing such hatred. We should forget such animosities that give rise to hatred and radiate compassion instead. Engaging in religious observances during the “Nonagatha” (Literally “no auspicious times”) period brings religion closer to our lives which are veering alarmingly away from moral values. The Punya Kalaya (literally a time for meritorious deeds) or Nonagathaya is designed to let us visit the temple or the Kovil to purify our souls. Thus the Avurudu brings to the fore the nexus between the village and the temple/place of worship. Many of the problems in our lives can be traced to the gulf between us and the place of worship – Avurudu gives us an opportunity to renew this bond which can make us better persons. The Avurudu tradition of worshipping our elders and seeking their blessings through the anointing of oil reminds us of the need to honour and care for our parents and elders at a time when they are neglected in many societies. Ganu Denu (transactions) goes beyond the literal monetary meaning of the concept of give and take – that sharing and caring should be an integral part of our lives. One can dismiss auspicious times (Nekaths) and Avurudu traditions as archaic beliefs that do not belong in the modern digital era, but they are rituals that still bind our society together and give us time to take a short break from the ‘rat-race’ lifestyle. Every New Year ritual has a meaning and a purpose. They prepare us for a fresh New Year filled with fresh resolutions. The symbolic conduit for Ganu Denu in Sri Lanka (as well as in neighbouring India) is the humble sheaf of betel leaves, called Bulath in Sinhalese. (A ‘Bulath Atha’ or sheaf is made up of 40 betel leaves). But there is another higher purpose – giving someone a sheaf of betel leaves means that you have forgotten or forgiven any enmity, misunderstanding or anger that may have caused a rift in the old year. There are many legends associated with the betel leaf which has become a pivotal item in New Year festivities. Legend has it that the betel leaf was first found in the mythical land of the Nagas. It is said that the betel was brought to the human world from the world of Naga by a cobra holding the tip of the leaf by its teeth, which is perhaps the reason why almost all betel chewers discard the tip of the leaf when preparing betel for consumption. The betel leaf thus symbolizes our close affinity with Nature. It is thought of as a harbinger of prosperity. Another important part of Ganu Denu is commencing some sort of work for the first time in the New Year. Called Weda Alleema in Sinhala and Er Mangalam according to Hindu traditions, this calls for starting some work that would bring prosperity to oneself and the family throughout the year. For example, a student can study a lesson and a farmer can work on his field. 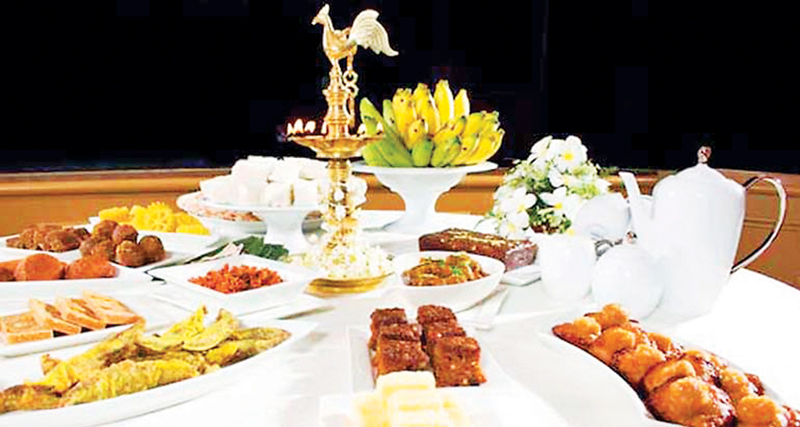 Avurudu is a joyous occasion - what would it be without all those sweetmeats? Some of the Avurudu sweetmeats are found nowhere else on Earth. Kavum, Kokis, Athirasa, Bibikkan, Mun Kavum, Peni Walalu, Asmee and many other types of sweetmeats adorn the Avurudu table, along with alien arrivals such as cake and biscuits. No Avurudu table can be complete without the obligatory Kiribath (Milk Rice), which is the first item cooked to mark the dawn of the year. The overflowing of milk in this instance symbolizes happiness and prosperity for the entire family and the country. In many Hindu households, sweet rice is made with new raw red rice, jaggery, cashew nuts, ghee and plums. The demands of commercialism have enveloped everyone in our families, including the children. Unlike in the days gone by, today’s children are pressured by parents, teachers and the wider society to study all the time in order do well at examinations at the expense of their playtime. However, Avurudu literally gives them a break from the tedium of studying and attending classes non-stop. 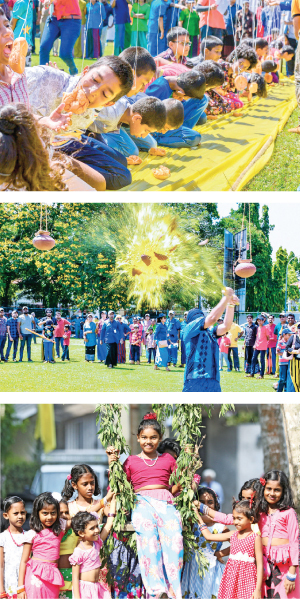 Avurudu is playtime, from the Onchillawa (swing) to nearly forgotten indoor games such as “Panchi” and “Keta” which are often revived for Avurudu. It is also a time when the children get a lot of gifts, from new clothes to toys. Naturally, it is the children that enjoy Avurudu the most, starting with the delicious sweetmeats on the table. Of course, Avurudu games and festivities have no age limit – everyone is free to join in the fun. Most villages do have “Bak Maha Ulela” events where the entire village comes together for a bit of downtime. Participating in many traditional games such as Pillow Fighting, Tug-O-War, Cadjan Weaving and Raban playing give the villagers an opportunity to reaffirm their bonds with each other with a bit of fun on the side. The authorities must also make an effort to preserve some of the more traditional games such as olinda keliya, eluvan keliya, mevara sellama, buhu keliya, muthu keliya and mee sellama. Of course, these events are open to all, regardless of communal or religious differences. This is significant at a time when there is a dire need to reinforce the bonds among different communities and religious groups. But Avurudu cannot be confined to one’s home or village. Avurudu gives us an opportunity to visit far-flung friends and relatives at least once a year with plenty of gifts and sweetmeats in hand. There is a massive rush to go to villages, with buses and trains filled to capacity. This is also one of the few chances for those based in the cities to go back to their villages for a few days to get in touch with their roots, so to speak. There are many other rituals and traditions associated with the New Year, such as bathing for the new and old year and leaving for work in the New Year. We might not have the time for observing all Avurudu traditions, but the lesson is clear – togetherness pays dividends in the form of peace and harmony. Avurudu is a time for a fresh start in every sphere of life. From new clothes to a new coat of paint to new aspirations, it marks a deviation from the old routine and signals that life is ready to take on new challenges in the coming year. Avurudu thus gives us fresh hope for a successful, bountiful year ahead.